Discussion in 'PatsFans.com - Patriots Fan Forum' started by TommyBrady12, Feb 12, 2019. I think he fits our offense like a glove. The question is, how much would it cost to sign him? I know BB tried to trade a 3rd rounder earlier this year but Philly had a higher 3rd rounder. I think he will sign for 3/30 or so. Tate and Jules with this run game would give teams fits. Do it. If we consider a 30y old Golden Tate for around 10m as a FA, I would take a swing at asking the Bengals how much they'd want for a 31 year old AJ Green in his final contract year at 12m. Signing Tate for around 10m would most probably cost us a third round comp pick (via Trent Brown or Trey Flowers) in a year anyway so if it is somewhat comparable might as well go for the moonshot and get a truly dominant outside guy. The Bengals might value draft picks over the final year of a player they might not extend anyhow. And "IF" Trey Flowers is out of our price point I can't see why we cannot have Adam Humpries. I think we would like to get younger at that position too. I'd be shocked if the Patriots don't at least talk to Tate and Thomas's agent. Tate especially. Tate immediately puts the Patriots as a SB favorite (If they aren't already). I almost wrote this, "Tate, Jules, and a first or second rder with this run game would give teams fits. Do it." But I decided for this statement the rookie was not needed. Definitely should draft one but not counting on it until it happens as BB seems fine piecing this position together. If we consider a 30y old Golden Tate for around 10m as a FA, I would take a swing at asking the Bengals how much they'd want for a 31 year old AJ Green in his final contract year at 12m. Signing Tate for around 10m would most probably cost us a third round comp pick (via Trent Brown or Trey Flowers) in a year anyway so if it is somewhat comparable might as well go for the ridiculous moonshot and get a truly dominant outside guy. Great call. This would be a great trade and may be realistic. Bengals need so many areas and are clearly not contending for a long time. I love Golden Tate (he can block as well as catch) but I'd rather have a deep threat who can create separation. Signing Tate for around 10m would most probably cost us a third round comp pick (via Trent Brown or Trey Flowers) in a year anyway so if it is somewhat comparable might as well go for the ridiculous moonshot and get a truly dominant outside guy. a 2nd rounder for AJ Green? 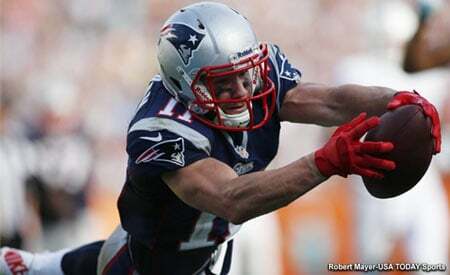 How will Edelman feel if we offer Tate $10m a year when he is making less than half that? And incidentally, there is no way we are giving a receiver $10m+ a year unless its a premier guy. Love AJ Green but he is too injury prone. I'm not trying to give up more than a 3rd for AJ Green. When Edelman signed a 2yr/$11m deal in 2017 it wasn't anywhere close to market value for him and you have to assume everyone knew that including him and his agent. Tate already has a super bowl ring so there is no incentive for him to sign anywhere unless he gets top dollar. His relatively low production in Philly helps teams like us and hurts him. You know we don't have that much cap room? You want us to give Edelman (who will be 32 at the start of the season) a pay bump so we can also then pay Tate? That's not a great plan given most want to re-sign Flowers et al. I think the plan has to be to shop in the bargain basement and give a few prove it deals out in free agency and then attack the draft and double dip there. I mean he missed like 16 or 17 games since 2011. Calling him injury prone is a bit strong. I think he could give us at least 2 really strong seasons on the outside. Even if his speed might decline at some point he is still damn good at getting those 50/50 balls. Again I am not saying it is a likely thing but just something I saw when looking at players in the final year of their contract. Those are usually more interesting than FAs.